Major donors want you to be effective and efficient — but most of all, they want to know you understand and value their partnership. Relationships are key for any fundraiser. 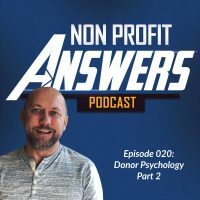 Donors want to feel like they have a relationship with your nonprofit, they don’t want to feel like it’s just a transaction. This is especially true for major donors. Before a significant commitment to invest in your nonprofit, a major donor wants to feel like she is valued, appreciated, and has a strong relationship with your nonprofit. First, you need to care about the major donor. Not as a donor, but as a person. You need to be invested into her life. Building a relationship that is outside of a financial commitment is the key to creating a mutually beneficial relationship. You see, you’ll find that a major donor can change a lot of lives, but the biggest changes will likely be to you and to her. Second, you need to understand your major donor and her desires and needs. Not every investment opportunity into a program at your nonprofit is going to be the right fit for a major donor. When you understand what sparks joy in your donor’s heart, you’ll find the right program or opportunity for her. Third, find ways to involve the major donor in non-ask ways. For example, invite him to an event that is not a fundraising event. Send an interesting article or book. Call just to talk. You’re building a relationship with this partner. Fourth, do what you say you will. When you make a commitment, make sure to follow up. For example, some major donors want less frequent communication. If you make the request to reduce the communication with this major donor, follow up to make sure it’s happening. When you focus more on your relationships with people and less on getting the next big check, you’ll find that the big checks follow quickly.